I recently ran out of my homemade scrubs and was in desperate need for a fresh one. 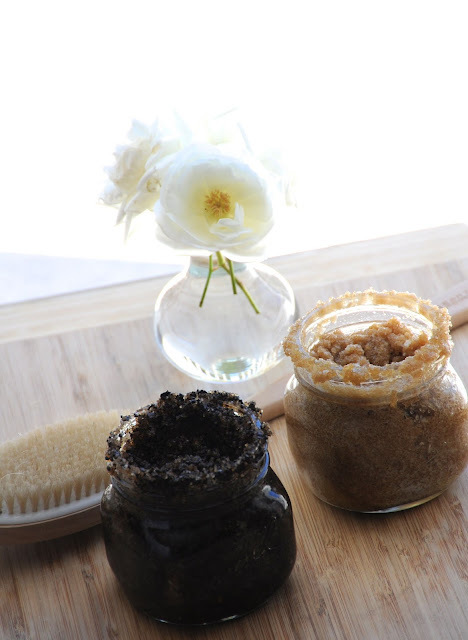 I've made several scrubs in the past (you can find them here, here, here and here) but my all-time favorite homemade scrub has got to be the coffee scrub. I know it wasn't as popular around here as some of the others, but I am obsessed with it. If you like the smell of coffee you will love this one. Bonus: If you have a bag of whole beans that have expired, you don't have to throw them out- make a scrub. Scrubs are such a lovely way to exfoliate the skin and create a nice glow. Opening up a jar during a rushed shower can give you a tiny escape from your busy day ahead, or relax you in the evening before you get into bed. They are also wonderful for dry skin, before you shave, and before you apply a self tanner. 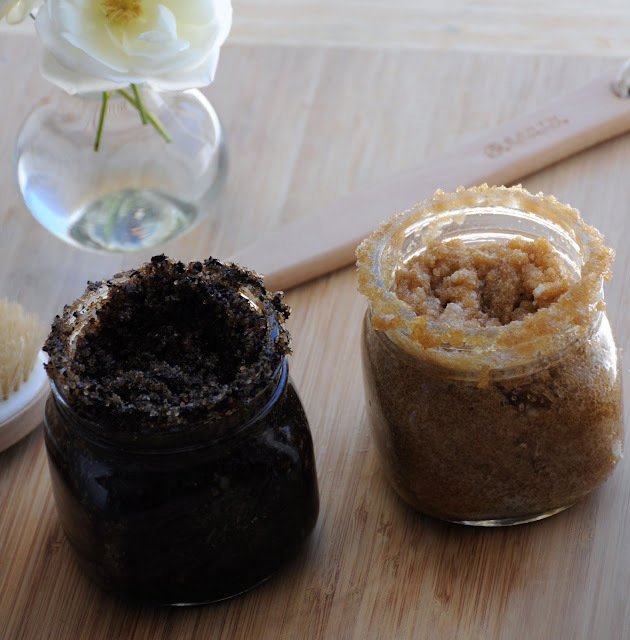 Here is how you can create a morning and evening scrub for yourself, or as a gift. None of the items below truly need to be organic, but it's always nice to treat yourself to organic goods if you can. Will the coconut oil solidify? Yes, it can if you have a cold bathroom. The solution? Scoop the scrub out of the jar & add a bit of water to it- then mix it up in your hands. It will warm it up and work fine. The scrubs above though use some olive oil which will help prevent it from solidifying. What is the shelf life? I have used them up to 3 months with no issues, but again, everybody uses different ingredients and has different climates. Enjoy a spa day/night soon! These look wonderful...I need to try making one! Definitely will try one, love the scent combinations! 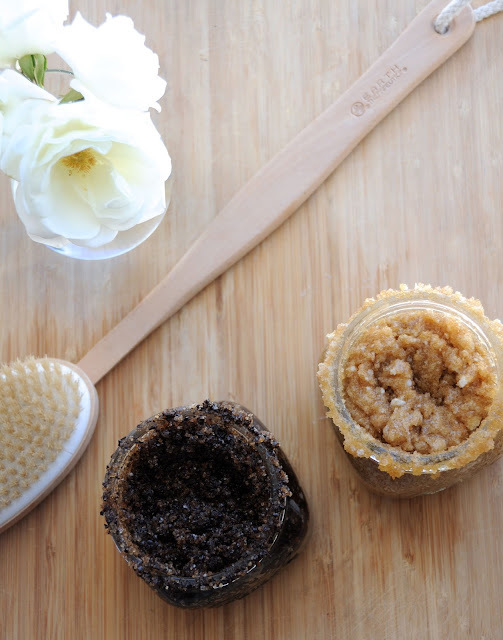 sounds incredibly relaxing and the coffee scrub must smell amazing! This would have been very handy coupleof years ago when I was looking at making my own scrubs. This looks so easy and simple to make. Thanks for sharing. i make scrubs all the time just with oil and sugar and a dash of whatever body wash i'm currently using. never thought of using coffee though! i have a full bag of very stale coffee beans that i didn't want to throw away but now have a use for!